HAVANA, Cuba — For years, U.S. mobile phone companies and internet providers have been banned from doing business with Cuba, further isolating one of the least-connected countries in the hemisphere. So when the Obama administration loosened those restrictions earlier this year, it looked like a tech surge was in store for the communist-ruled island. But after months of silence, Cuba seems to be saying no thanks. Other outstanding trade and legal grievances need to be resolved before American telecommunications companies are granted access, a Cuban telecom official said Saturday, in a statement that appeared to rebuff one of the Obama administration’s key Cuba policy initiatives. But the Castro government exerts strict control over the island’s communication networks, and American companies would have to reach a deal with the government’s telecom monopoly, ETECSA. Months passed without a response to Obama’s proposal. But during an official government newscast Saturday, ETECSA international operations director Vivian Iglesias said there were two major obstacles to such a partnership: some $160 million in frozen funds that the U.S. government seized from ETECSA in 2000, and trade restrictions imposed by the 1992 Cuban Democracy Act, which forces Cuba to pay U.S. companies through third countries, incurring additional transaction fees. Iglesias’ statements were a reminder that a firewall of mistrust remains between two countries split by 50 years of hostile relations and emotional politics. Previous agreements between U.S. telecom companies and ETECSA went sour in the late 1990s, when U.S. legislators ordered ETECSA’s funds seized as payment to Cuban American families who won a wrongful death judgment against the Castro government after four pilots from a Cuban exile group were shot down in a 1996 dispute. Iglesias said that money was “stolen” from ETECSA, and hasn’t been paid back. Other U.S. lawsuits in recent years have resulted in hundreds of millions in judgments against the Cuban government, which is squeezed for cash and wary of additional financial liability that might result from new deals with American companies. Cuba currently ranks among the least-connected countries in the hemisphere, with 12.6 phones per 100 people, according to United Nations data. A limited number of Cuban professionals have access to the internet, but mostly in their workplaces, where communications are often monitored. An hour of achingly slow web access at a tourist hotel can cost more than a week’s salary for the average Cuban worker. Cuban mobile phone communications aren’t much better. Though President Raul Castro overturned a ban on ordinary Cubans owning mobile phones last year, rates for local calls are roughly $0.50 per minute. A call to the U.S. costs more than a dollar a minute, and there’s little alternative for keeping in touch with relatives in Miami or Spain, since the popular voice-over-internet program Skype was blocked by the Cuban government over the summer. The Obama administration’s move gave permission to American telecommunications companies to install fiber-optic cable and satellite links between the United States and Cuba. It also allows for roaming agreements between U.S. and Cuban mobile phone providers, while enabling U.S. residents to pay for American satellite radio and television services for Cubans, which are generally illegal on the island. The measure was part of a package of reforms that made it easier for Cuban Americans to visit their relatives and send financial assistance. 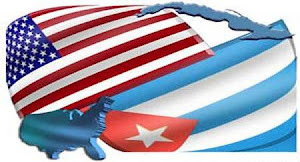 Other steps to improve communication, such as a proposal to resume direct mail service between the two countries, are under consideration as part of a general U.S.-Cuba thaw. "We stand on the side of having more information rather than less information reach the Cuban people," said Dan Restrepo, an Obama adviser, at the time. Obama’s directive made no mention of ETECSA’s frozen funds. Not surprisingly, Cuba continues to blame many of its communication shortfalls on U.S. trade sanctions that have historically tried to isolate the country. “Cuba only has one line of communication to the rest of world, and that’s through satellite,” said ETECSA marketing director Jorge Luis Lerga, in an interview Sunday on state television. “Its capacity is 10 times less than an international fiber optic cable,” he said. Cuban ally Venezuela is spending $63 million to stretch an undersea fiber-optic cable across the Caribbean to give the island a better link to the world, though that project is not expected to be completed until 2011. Legra said ETECSA was working to upgrade capacity with the goal of offering home-based internet service to more customers, but he did not give further specifics. Given that Florida is just 90 miles away, a connection to the U.S. would be a far more practical option for Cuba. Last week, a small Miami-based company, TeleCuba Communications Inc, announced it had obtained U.S. permission to lay a fiber-optic cable to the island, but statements by ETECSA executives suggest that deal is likely to face similar obstacles.